California architect Peter DeMaria transforms surplus cargo containers into modern homes that are stylish, affordable, and good for the planet. Drive past any port in America today and you’re bound to see row upon row of empty shipping containers stacked, like so many colorful building blocks, one atop the other. Due to the United State’s ongoing trade imbalance with countries like China, roughly half of the shipping containers that enter our ports never make it back to their points of origin. Not surprisingly, this growing glut of steel cargo containers has prompted more than a few creative minds to start thinking outside the box. One of them is Peter DeMaria, an innovative California architect who has spent the last decade exploring the potential of these retired containers as affordable building materials. “For me as an architect, the challenge had always been how to give my clients the highest level of design while still keeping the projects on budget,” say DeMaria, one of the country’s first architects to incorporate steel cargo containers into residential designs. Indeed, soon after he built his own home in 2003 (and saw firsthand how even a small change in the cost of materials can wreak havoc on the bottom line), DeMaria took a year-long sabbatical and started searching for alternative building materials that could add value to his projects while helping to reduce costs. Shipping containers showed exciting potential. “They’re widely available, inherently strong, and inexpensive when compared with more conventional building materials like steel and concrete,” says the architect. They’re also resistant to fire, mold, and termites, and made of heavy-gauge steel, a material meant to last centuries. Plus, DeMaria adds, the containers’ uniform sizes (they come standard in 20- and 40-foot-long sizes) lend a level of predictability to projects that are usually anything but predictable. In 2006, DeMaria got his chance to build his first container house in Redondo Beach, California. “We were lucky to find clients like Sven and Anna Pirkl. They not only wanted a residence made out of containers but they were creative and bold enough to push the envelope with me,” notes DeMaria. “It was a match made in heaven,” concurs Sven Pirkl, who along with his wife, an artist, envisioned a modern, loft-style house that was both eco-friendly and budget-minded. In DeMaria’s hybrid design for the Redondo Beach House, conventional stick-frame construction combines with eight repurposed steel shipping containers to form the two-story home. The contemporary house sports four bedrooms, three-and-a-half baths, and a soaring 20-foot-high living room outfitted with glass-panel airplane hangar doors that fold out to create a seamless indoor-outdoor living space. To play up the industrial good looks of the containers in their new home, the Pirkls chose not to cover-up the corrugated steel walls with siding or to replace the sturdy maritime wood floors that come standard in cargo boxes. For long-term energy savings, low-flow plumbing fixtures, LED lights, and Energy Star appliances were installed throughout the house. Stick-frame walls were insulated with UltraTouch, a recycled denim material, and the rooftops and walls of the containers were painted with a thick coat of white ceramic insulating paint originally developed by NASA. And thanks to simple passive solar techniques, like orienting the building to catch the prevailing breeze, the house remains cool and comfortable year-round. Since the Redondo Beach House, DeMaria has built nearly a dozen container buildings, including a residence and gallery in Venice Beach and a community center in East Los Angeles. He’s also working on affordable housing projects in the U.S. as well as the Middle East, and just breaking ground on a custom family residence in Mar Vista, California “We’ve streamlined the process and learned more about what the containers can hold up to and how we can modify them,” notes DeMaria. 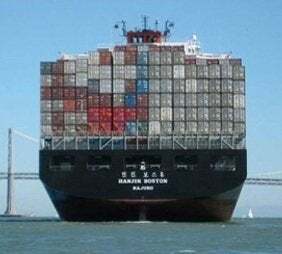 Most containers come in 20- and 40-foot models and generally cost between $1,650 and $3,000 each, depending on size and wear and tear. One-way containers that have only made one passage are usually in the best shape and demand a premium. For residential projects, DeMaria prefers High Cube models, which have a taller 9’6” ceiling. Another thing he’s learned is that there’s a whole contingent of design-minded home builders who’d love to live in a container home but can’t necessarily afford to commission an architect. 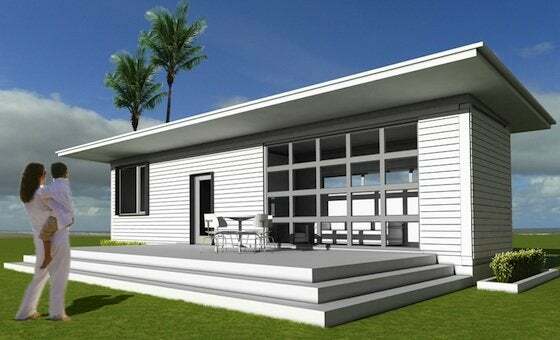 To address this groundswell of interest, DeMaria created Logical Homes (logicalhomes.com), a web-based portfolio of seven affordable model container homes. “We don’t believe good architecture is something that should only be experienced by the wealthy,” says DeMaria, “so we changed the way we deliver our product.” The model homes, which DeMaria refers to as “next-generation prefab,” come in 16 different configurations, all of which are available as is or tweaked to the buyer’s specifications. Logical Homes contemporary designs range from the compact 320-square-foot Kara (pictured below), which features a roll-up garage door that opens onto a 270-square-foot porch, to the 1,692-square-foot Seto, a three-bedroom family home, which can be affordably expanded to five bedrooms by simply taking off the prefabricated Techno roof, adding more containers on top, then putting the roof back on—no moving out required! “We never want anyone who moves into a container house to feel like they’ve had to make compromises,” says DeMaria. As such, customers can customize the seven basic models, including sheathing the corrugated steel walls in siding to camouflage their industrial pedigree. The models range in price from $49,000 for the smallest unit to $449,000 for the supersized 3,560-square-foot version of the Seto, which includes five bedrooms, three-and-a-half baths, a great room, second-floor deck, twin garages, and a covered front-porch with a built-in fireplace. 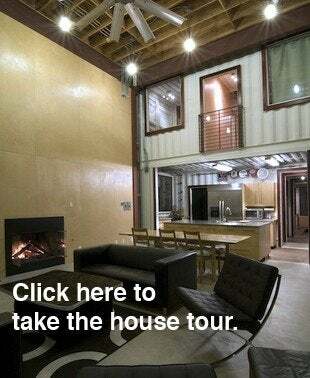 To see more of the Redondo Beach container house, take our House Tour slide show. To learn more about Peter DeMaria’s work, visit DeMaria Design. To price containers in your area, click here.